To me, a good cheeseboard is synonymous with Christmas Day. In our household we usually have a Christmas lunch, not dinner, and we try to eat about 2pm. Though this often gets pushed back to gone 4pm because we had a few too many glasses of bucks fizz with our smoked salmon and eggs in the morning and then gorged on chocolates! But, either way when it gets to about 7pm and a couple of games have been played, the port is out, we reach for the Christmas cheeseboard. I love grazing on the cheeses as the evening goes on! 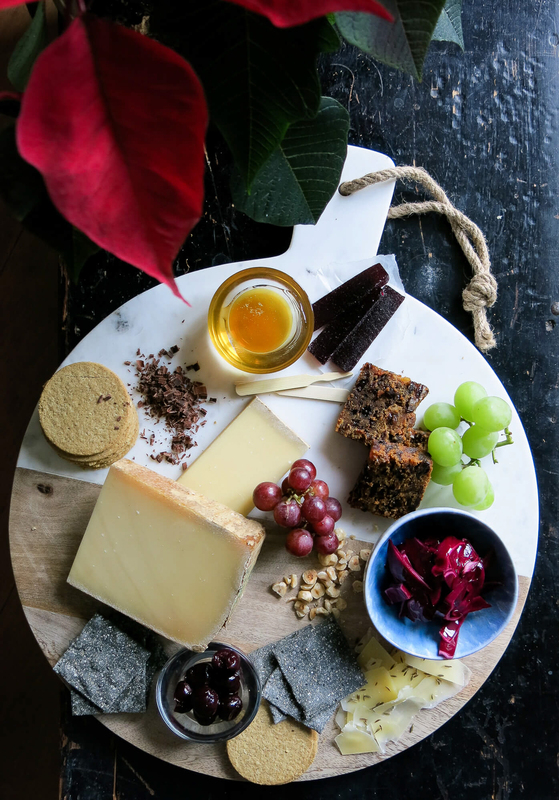 Usually on our Christmas cheeseboard there are a variety of cheeses, a chutney and maybe even some quince. But I’ve realised I’ve been doing it all wrong! 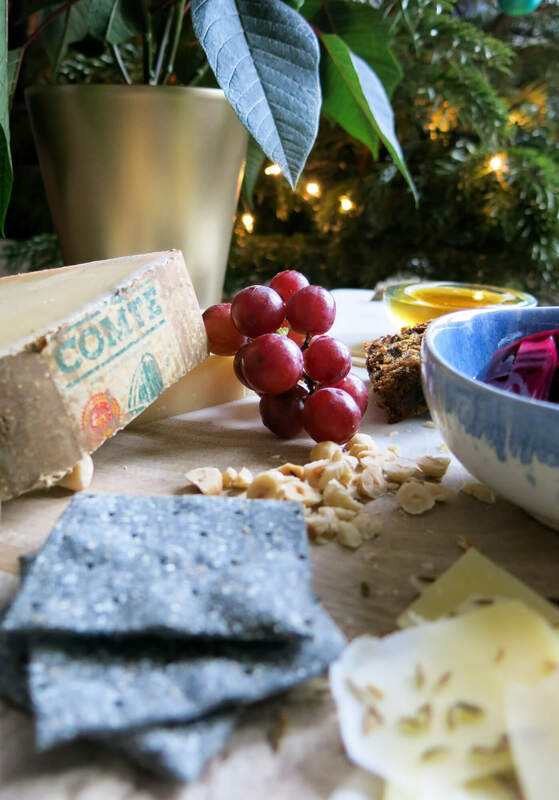 A couple of weeks ago I was invited along to an evening of cheeseboard pairings with Comté and I learnt how to create the ultimate winter cheeseboard. It was such an interesting night, learning even more about the incredible cheese that is Comté but also learning about interesting tips about pairings. Some of the pairings I had heard of before but some were completely new to me. 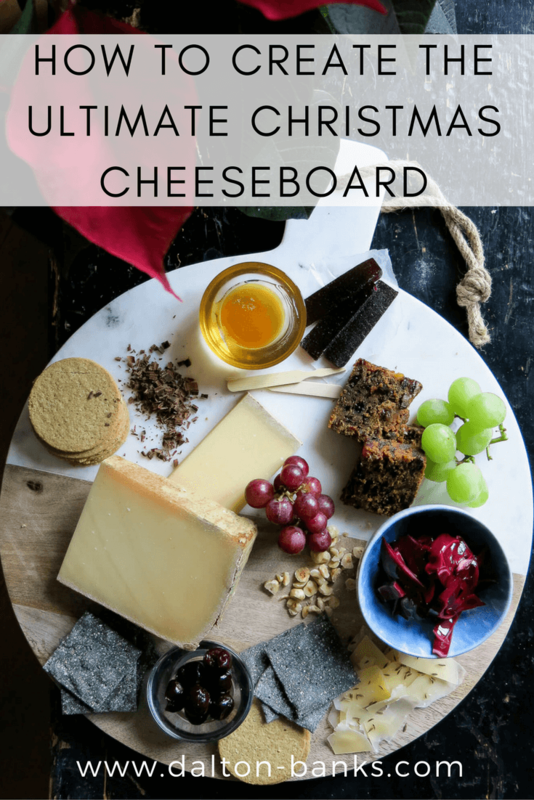 So, in the spirit of Christmas I wanted to share these awesome pairings and show you how to put together the ultimate Christmas cheeseboard! I have been lucky enough to attend a few Comté events and each time I love hearing about history, commitment and craft that goes into making this delicious cheese. For over ten centuries, villagers of Jura Massif in Eastern France have loving crafted Comté. This beautiful region of mountains is home to over 2,500 family farms dedicated to producing the highest quality of raw milk required. The methods of production used today to create Comté are still based on the original co-operative approach (owned by farmers) and artisan traditions that it was founded on over 1,000 years ago. How incredible is that! Montbéliarde and Franch Simmental are the only cows allowed for the production of Comté milk and they must only be fed with natural feed and have at least 2.5 acres of grazing pasture. It really is a love affair for them as 365 days of the year the milk is transformed into large wheels of Comté cheese by the small village dairies. This means each wheel of cheese if so diverse in its textures and flavours depending on the time of year it was produced – I love this! This is also why Comté is such a great addition to your Christmas cheeseboard. I decided to take everything I learnt from the evening to give you a helping hand when thinking about what you need to get for your cheeseboard this Christmas. 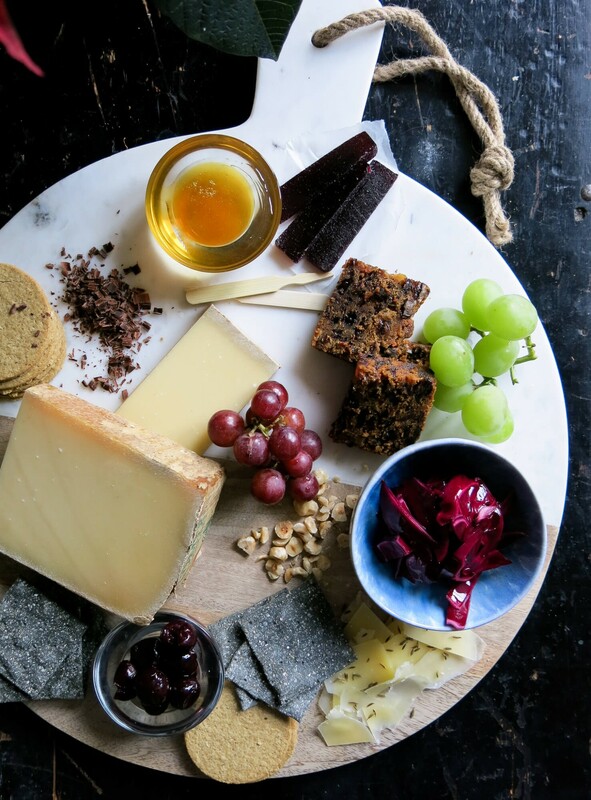 Creating an interesting cheeseboard doesn’t just mean having a variety of cheeses and a chutney, it means adding in different textures and flavours that compliment the cheeses on your board. If, like me you are a fan of sweet and savoury flavours together then you can really go wild on this! Honey is the obvious one, but I’d only really thought of it with goats cheese or feta, but it paired very well with the young Comté. Get one of those fancy honey drizzle sticks and add a pot to the cheese board, things may get a little sticky but it works! The biggest surprise? Kirsch soaked cherries. Did anyone else used to think if they ate enough of those fancy cherry liquor chocolates they might get a little tipsy!? I mean I was about 10 but still, my love for kirsch cherries has been around for a while! However, I would have never paired them with cheese, but the dark intense flavour of the cherries and their acidity with the creamy cheese is delicious. Sprinkle some dark chocolate flakes over the top to add a sweeter edge. Fruit and cheese are a classic combination, hello grapes! 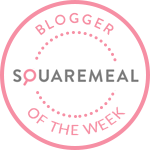 And yes, we’ve all seen quince jelly but have you tried something a little different like a blackcurrant jelly? The dark colour really stands out on a cheeseboard and the tartness of the berries is again a great flavour combination. Another sweet and savoury heavenly combination is Christmas cake. You have to put this on your Christmas cheeseboard!! Crumbly, rich fruit cake works so well with a mature Comté. The tangy, slightly crystallised cheese with the juicy sultanas is hard not to like. One pairing I was surprised to see was the pickled red cabbage! Now, I absolutely loved braised red cabbage, I make huge batches of it every year around Christmas, but pickled cabbage on a cheese board? Well, let me tell you it works very well indeed. The sharp cabbage works well with a more mature Comté, and the slight crunch adds an extra dimension to the mouthful. I have seen cumin seeds in cheeses before, but at the event the Comté was shaved with cumin seeds sprinkled across the top. I had never thought to serve the cheese in anything but blocks, and you slice as you go. But having shavings of the cheese was not only interesting to look at, it gave the cheese itself a different texture, almost melt in the mouth. If you have got a hard cheese on your board, this is definitely something to consider. The shavings work beautifully when building up mouthfuls with other items on the board. I add some kind of seed or chopped nuts to most salads I make, just to add some variation and texture. Why not do this to your cheese board! I love chopped hazelnuts, they work well with the honey but combine the chopped nuts with a few shavings of chocolate on top of your cheese. It tastes great! 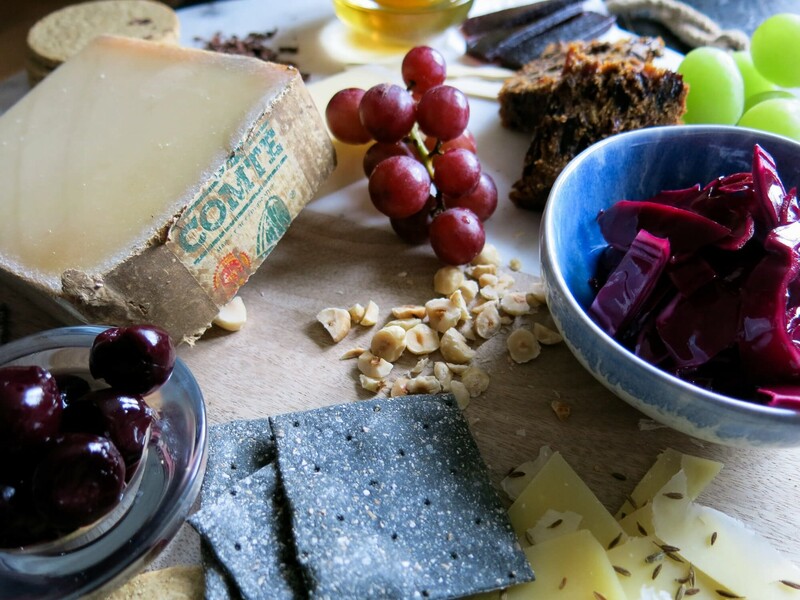 Do you have any weird and wonderful flavour or texture combinations on your cheeseboard? Do you think these would go down well at your Christmas table? *I was a guest of Comté at their evening of cheese but as always opinions are my own. Some great ideas there, Vicky! Your cheeseboard looks gorgeous. 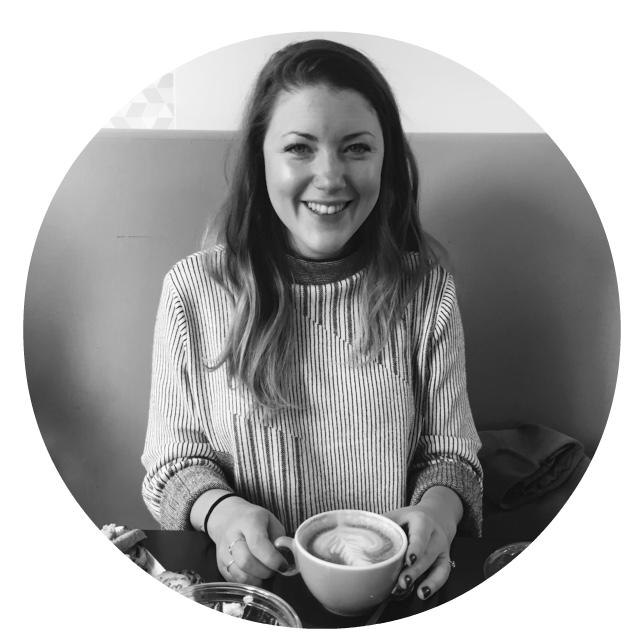 I’m planning to always do a cheeseboard for my supper-club, so thanks for the tips! Thank you Aaron! It was lots of fun to photograph 🙂 I hope the tips help! I like the fact that there are fruits added. It adds up flavor and it is not boring. Exactly, its a great way to make cheeseboards a little more interesting. I love adding fruit!